Since the second half of the 2017, a large number of e-cigarettes with touch functions emerge. This product I am going to introduce is Ovale’s first step into the touch screen niche-Ovale Tron TT200. In terms of the appearance, the Tron TT200 is very fashionable. The back and front surface employ glass material. And it looks very classic and elegant. The fire buttons are placed on the both side of the host with the traditional Mechanical ignition key on the left and the TAPTEC touch ignition key with touch technology and vibration feedback device in case of accidental touches just like the Apple iphone. The diameter of the 510 connector is 21.7mm. The application of side-pull cover is quite different from traditional bottom-pull cover. 1.Preheat function: it can set the initial power and the time of initiation and quickly heat the coil to the desirable temperature. To this point, it is useful. 2.Revers Charging: The mod can serve as a power bank with an adapter. However, it is just a plus to this mod and this function is used in times of emergency. 3.Foot-count function: The vape kit has a special function for sports lovers. It can record the miles you walk. However, this is not so practical for most of you won’t take such a big thing to running. 4.Time Function: This is so commonly seen in today’s vape. 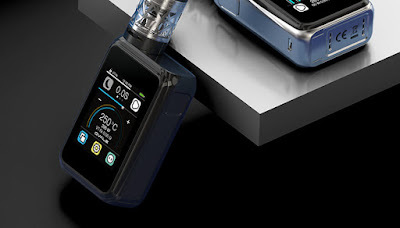 Although manufactures have put great efforts on the improvements of the functions of this vape. However, it seems they have ignore the most important thing-the vaping experience. By adding lots of high technology, they still do not break the bottleneck and provide consumer with the most satisfied vape.